AUDIENCE: Get this one if you are after a very good introductory book on the subject, but don’t expect THE exhaustive toolkit for all aggression problems. REVIEW: I was hoping for a book cataloging an exhaustive list of aggression issues, with detailed instructions and advice on protocol. Instead, I was left feeling I had to order and sort the information to be able to make sense of it, and to then do my homework on the details of the treatments that are mentioned. I can imagine that there is a certain element of protectionism in keeping detailed information protocols to oneself, but it felt like the book ‘didn’t do what it said on the package’. 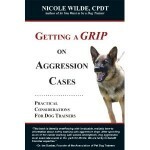 It had some particularly useful chapters, including the introduction to the various kinds of aggression and their treatment (regretably, it stayed introductory), the history-taking form template, and the assessment scale of aggression severity. Browse the Book Review archive. Genre: professional manual. Author: Wilde Nicole. Reading Level: Professional. Star: 2. Bookmark the permalink. Post a comment or leave a trackback: Trackback URL.